Scorpion DJ? Or just a scorpion pose with DJ gear. Programming music for yoga is more than just picking out random downtempo beats. As a special event DJ, I find myself gigging at all types of events. There’s the usual wedding, birthday party, graduation party, pool party … okay, basically anything that ends with the word party. But it was not until 2015 that I found myself playing tunes in situations many would not consider a party at all … fitness events. And more specifically yoga events. Yoga, as an activity, was something I engaged with more in 2015 to supplement all the running and other physical activity I do each week. Yoga has benefits both mentally, physically and spiritually. But yoga as an event, where hundreds gather outside of the traditional studio and into unconventional spaces and waterfront places, found me. In fact yoga events have really taken off during the past few years. Check out this list of seven massive yoga events. 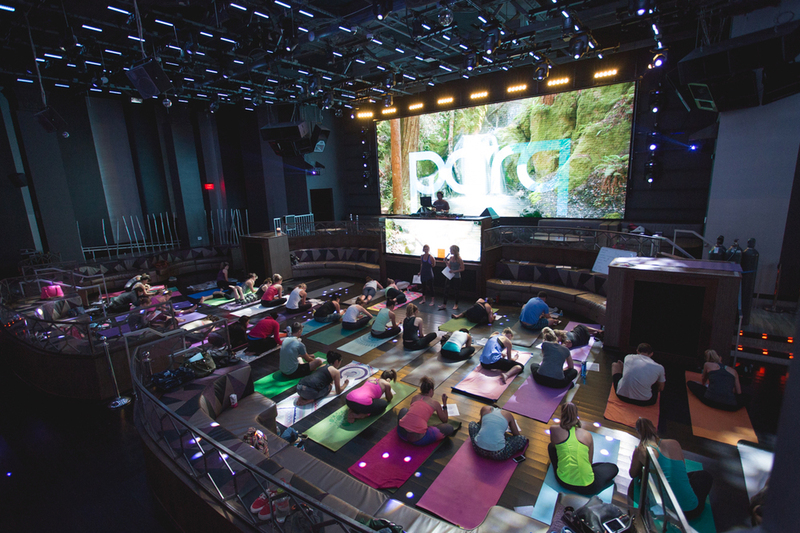 Events such as Wanderlust, Seawheeze and the summer solstice in Times Square attract thousands of yogis. Why are people stepping out of the warm confines of a yoga studio to tree pose in the outdoors? There’s just something about 500 people all simultaneously saluting that sun, while actually under the sun, that seems so much fun. Since that first event, I’ve DJ’d a handful of other yoga events and feel I have a good recipe for creating the perfect yoga playlist. 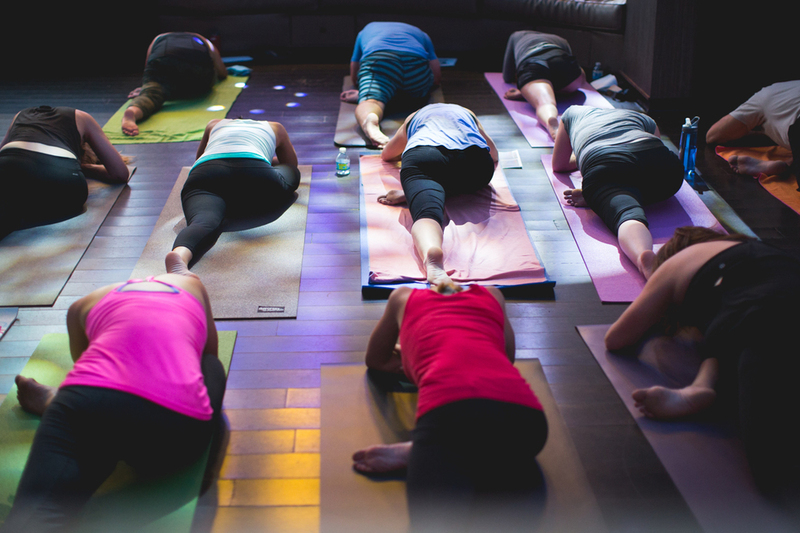 Just like building the energy on a dance floor, there is an energy you can build on a yoga mat. For those old enough to remember making mix tapes, preparing music for a yoga flow is similar to creating one of those. When you handed someone a mix tape, they took it to heart and truly listened to it. Unlike creating 45 minutes of background music, the students in a yoga class are tuning in to what is playing. The music becomes one with all of the other senses that are at play during their yoga practice. Here are few tips for programming a yoga playlist, both for DJs that might find themselves playing one of these events, and for yoga instructors who program their own music. DJ Justin Kanoya plays music for a yoga event sponsored by Fitbit. Obviously aimed at DJs who have never taken a yoga class before, I want to stress how important it is to actually experience yoga before creating music for yoga. As with any type of new gig, it’s always better to have previously been engaged in or attended the event that you are playing music for. In the same way that it’s not wise to DJ a wedding if you’ve never been to one, it’s not a good idea to blindly put a yoga playlist together if you’ve never flowed from cobra to chaturanga to downward dog. Yoga studios are everywhere and offer classes everyday at all hours. Go check one out, and of course, pay close attention to the music. Yoga, at least at the beginning to intermediate level is taught at a soothing, slow pace. Naturally the music that goes along with it should have similar characteristics. But that doesn’t mean playing tracks that average 80 BPM. It means listening to your music and recalling certain tracks that have harmonic breakdowns. When listening, imagine doing yoga poses to the beat. Are the sounds, beats and vocals soothing or annoying? If it’s the latter, then it’s probably not right for your playlist. The practice of yoga prides itself on being open to all and so, naturally, the genre of music one might hear during a flow should be open too. It’s easy to get caught up in the cliche sounds of Enigma, Enya or downtempo lounge. But realize, if you fall into these cliches, you’re not setting yourself apart from the other yoga playlists people have heard. 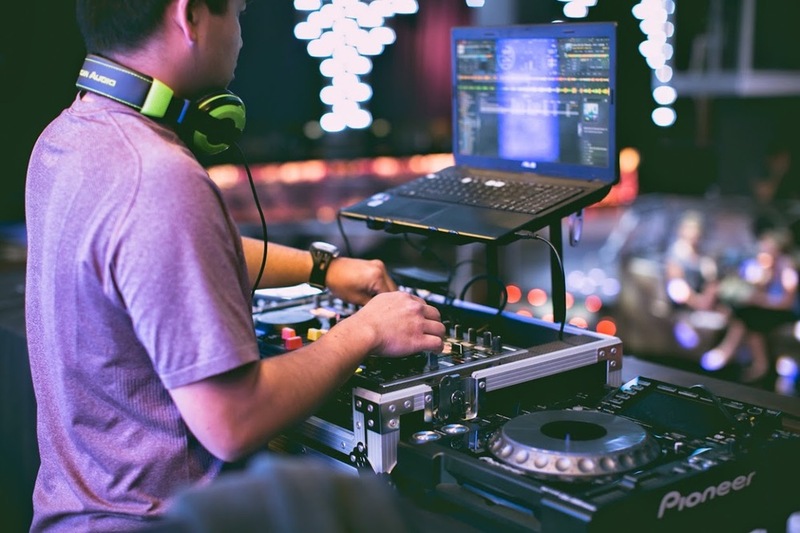 Since super downtempo music is not exactly on the list of club bangers and dance floor fillers, this is a good opportunity to explore genres that you typically do not listen to or play. House music also has tracks that work. Artists like, Kygo, Purity Ring and Roger Shah have all found their way into my yoga DJ sessions. San Diego based yoga teacher, Helen Cloots. You may think 45 minutes of instrumental tracks is the way to go. And it makes sense, especially realizing there is a yoga instructor who is, well, instructing. This means if you’re playing vocal tracks and the instructor is giving commands over that, things could get a bit messy. While this can be true, there is a way to mix in vocal tracks appropriately. I generally start the first 7-10 minutes of a yoga set with non-vocal tracks. I then like to insert a vocal track, usually something Indie or unfamiliar to most. Remember the music, in this case, is supposed to create an atmosphere of calm. I don’t want someone to hear a song and think about the last party they were at and how they were jamming to it. The reason for mixing in a vocal track is to change things up a bit. If the entire 45 minute yoga session was ambient, non-vocal music, it would just sound like white noise after a while. Following up an “unfamiliar” vocal track, I like to put in another instrumental or play a more familiar vocal track. Recently I’ve been playing Adele’s “Hello” and Taylor Swift’s “Wildest Dreams,” however not the mainstream radio versions that EVERYONE has had enough of by now. The “Dustin Que” trap mix of “Hello” is pretty amazing. This is where research and finding remixes really benefits in setting yourself apart from the others. The final pose in every yoga flow is savasana, also called corpse pose. It’s when the entire class lays flat on their mats, like a corpse, taking their bodies to complete relaxation. Ironically, it’s been billed as the most difficult pose in yoga because many find it difficult to relax their body and free their mind of all thoughts. As a music programmer, you can help by selecting the right piece of music. In this case, a vocal track is not recommended. The track should also not have a distinctive beat. This is when you need to find something that is ambient and non-descript. Beats, vocals and instruments can cause someone to focus on those sounds and they will have a difficult time relaxing. Finding the perfect savasana track, is just like finding that perfect dance floor filling song. The best way to discover these tracks is to find a quiet space and listen to different pieces. Close your eyes and see if you can get lost in the sounds and venture into relaxation. Have you DJ’d a yoga session before? And for the instructors out there, who are some of your favorite artists or genres to teach to? My passport and headphones are ready to go to the Lululemon Managers Conference. Years ago I read one of those lists that was bullet pointed with life tips. One of those tips said to make sure to always have a valid passport, because you never know when you might get the urge to leave the country. Thankfully I’ve followed that advice, because I'll need my passport next month. I’m going to Vancouver, B.C. again. Returning to "Van" -- as the locals call it -- for the second time in less than two months. When I was there in August it was to run 13.1 Seawheeze Half Marathon miles. This time it’s to DJ for 1,000-plus Lululemon employees and guests at their annual manager's conference. Just to reiterate that .... I'm DJ'ing Lululemon's worldwide conference in Vancouver. It's a bit surreal. Especially when I realize it's all because of a 1,000-word blog post that got shared around the world. A post that was read by more then 10,000 people, and from I've been told, touched hearts, brought chills and even tears of joy. I didn't write it expecting anything. I just wanted to say thank you. I suppose it's true what people say about finding things when you least expect it. For the past few years I used to sit in an office, knowing there was a better way for me to contribute to this world. To do so I needed to be in a different place. I knew there was a conversation that I could feel comfortable participating in. You find those places and conversations by engaging with others that want to take you there, and I'm glad I'm finding those people. 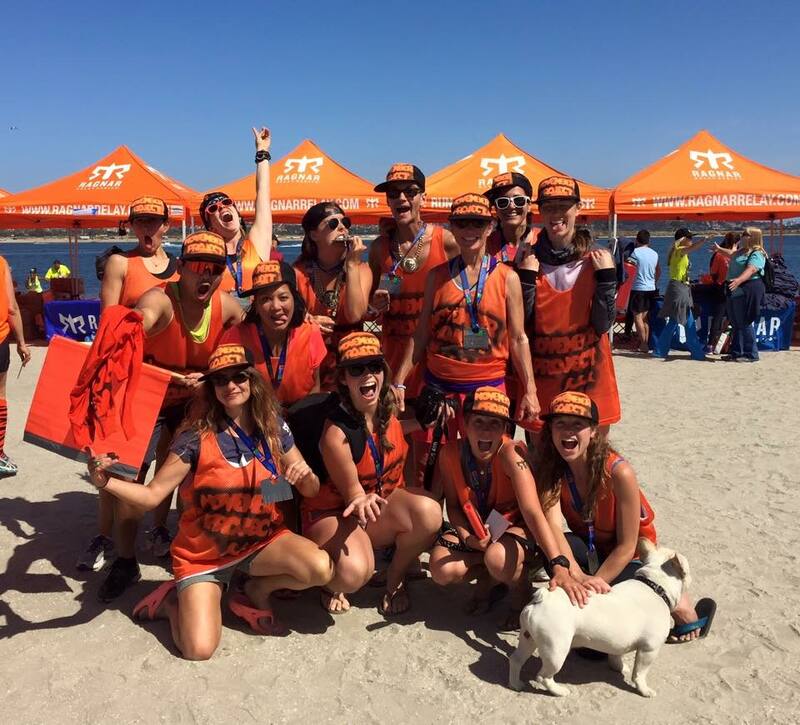 Brett Timmons, a Lululemon Key Leader in San Diego (and one of those aforementioned people), said it best "don't tell someone at Lululemon your 'big hairy audacious goal' if you don't want it to come true." That might be the best mistake I've made. This letter is to no one in particular at Lululemon. It could be a customer service manager, marketing director, executive Vice President or maybe even CEO Laurent Potdevin himself. This letter is to anyone at Lululemon who would find it comforting to know you are doing it right. And I’m not just speaking about your product line, because yes that is all kinds of right, but I’m speaking about your corporate culture. The values you instill in your employees and the way they carry those values through the customer experience, it’s all working. Where is this coming from? Let’s take a step back to just over a year ago. My wife and daughter enjoy frozen treats at the 2015 Seawheeze Half Marathon race expo. Are you familiar with the movie “Sliding Doors”? The lead character, played by Gwenyth Paltrow, faces a crossroad at the beginning of her day as she descends upon a stairwell at a subway station. In one scenario, she snags her coat on a handrail causing her to miss her train by just seconds. In the other scenario, she does not miss the train. The movie goes on to explore how different her life plays out based on the outcome of those two scenarios. In life, we also have these scenarios. A missed train or bus; a missed green light; dorming on the fifth floor instead of the fourth floor freshman year in college. The outcomes of these varying experiences affect who we meet, who we become friends with and the direction are lives go. The first was a phone call I made that ultimately led to an internship during college, which led to my first job out of college, which led to another job, which led to meeting my wife, which led to … well you get the idea. 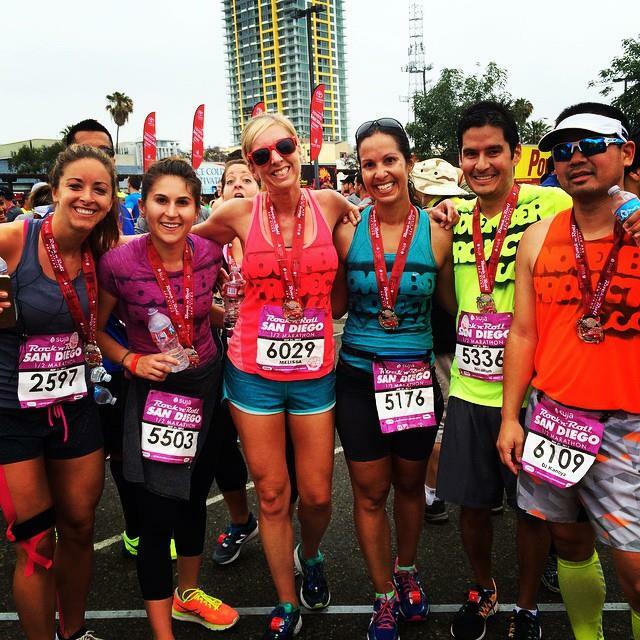 The second of these moments was in February 2014 when I decided to attend a free run club meetup organized by the Lululemon store in La Jolla, California. The announcement, posted on Facebook, promised a healthy dose of hill work. This was something I needed because I was running the “hilly” La Jolla half marathon just a few weeks later. Had there been no mention of hills, I probably would not have attended. 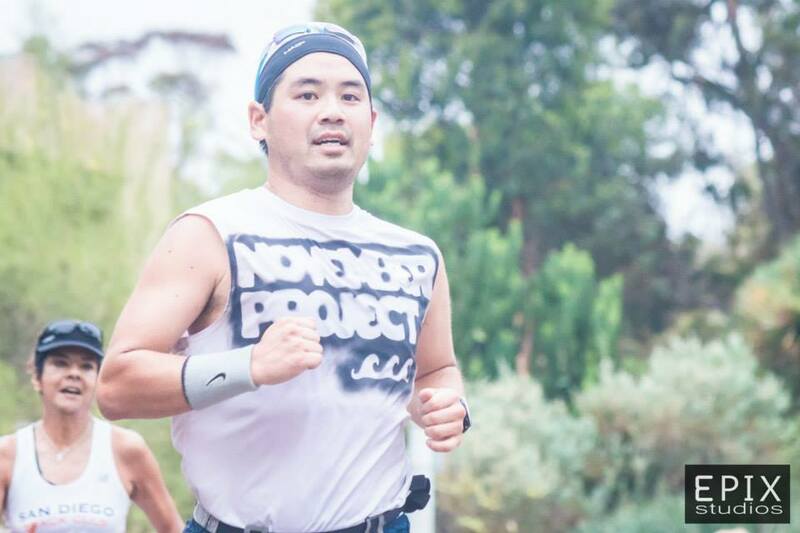 I didn’t really have any other incentive as I was already participating in another run group and I wasn’t necessarily looking to find another social group. I just wanted to learn a little hill running technique. I showed up, met Lululemon run ambassador, Sheri Matthews, and had a great workout. The following week I returned and eventually became a regular attendee through the spring and summer. During those months I met a lot of people and I got to know them as we shared running miles. I also learned of another free workout group, November Project, and started regularly attending those workouts in late August. At this point I was inadvertently expanding my social circle and getting into the best shape of my life. Many of the people I was training with each week were employees from the various San Diego based Lululemon stores. 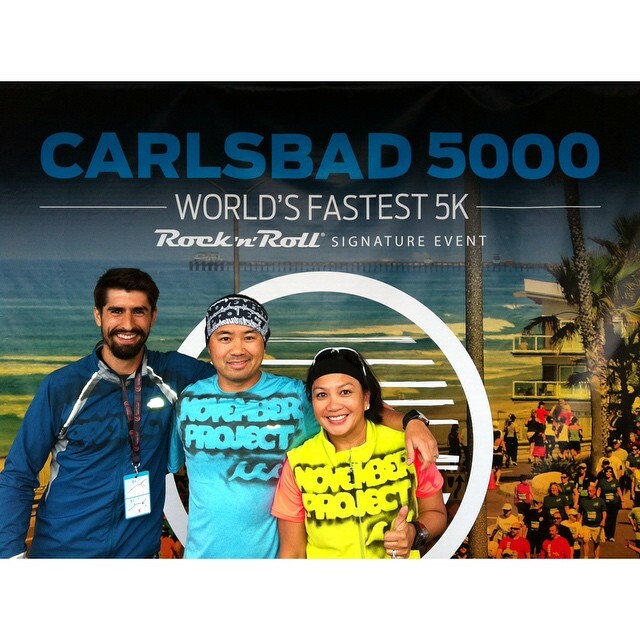 I was also meeting other ambassadors such as Helen Cloots and newly crowned run ambassador and November Project San Diego co-leader, Lauren Padula. 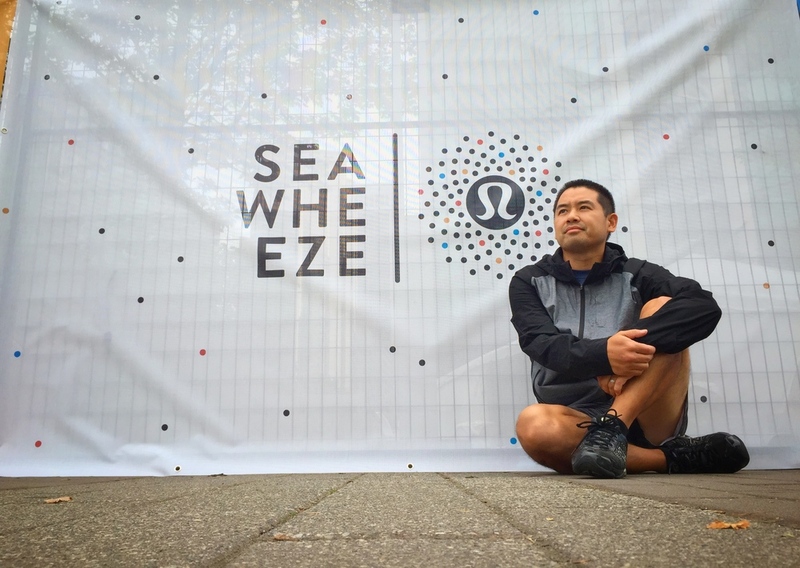 Through my interactions with ambassadors (whether at a workout or a casual conversation) and the employees (whether at a workout or shopping) I was also learning more about Lululemon’s culture. I saw how these people were setting goals and committing to them. I saw how nonsense of the past didn’t bother them and it was all about forward thinking. I realized that the life we create is just that … it is the life we create. It doesn’t need to be dictated by someone else. Only we have the power to write our own history and make the best of whatever “sliding door” we take. I also watched as people around me were leaving their jobs and diving directly into a life that means something to them. And so I did the same thing. I delivered this message to my co-workers the day I announced I was leaving my "day job" after a 13-year career in public service. After years of pondering and 13 years in the same government job, I walked away to build up a mobile DJ business that I have half-committed to for the past decade. The decision to do that was not an easy one. But I realize the trigger to make that decision all stems back to that one day I said “yes” to attending a hilly, Lululemon run club workout. You’re doing it right Lululemon. The values you instill in your employees means they carefully choose who their local ambassadors are. It’s not just someone that looks good in your clothes, but someone that also breathes the same values you hold important. These employees have also become my friends, both offline and online. When is the last time you “Facebook friend requested” a retail sales clerk … probably never? I’ve started to brand myself as both a fitness and yoga DJ, providing beats for Lululemon shoppers and one very special yoga event at Parq San Diego nightclub. 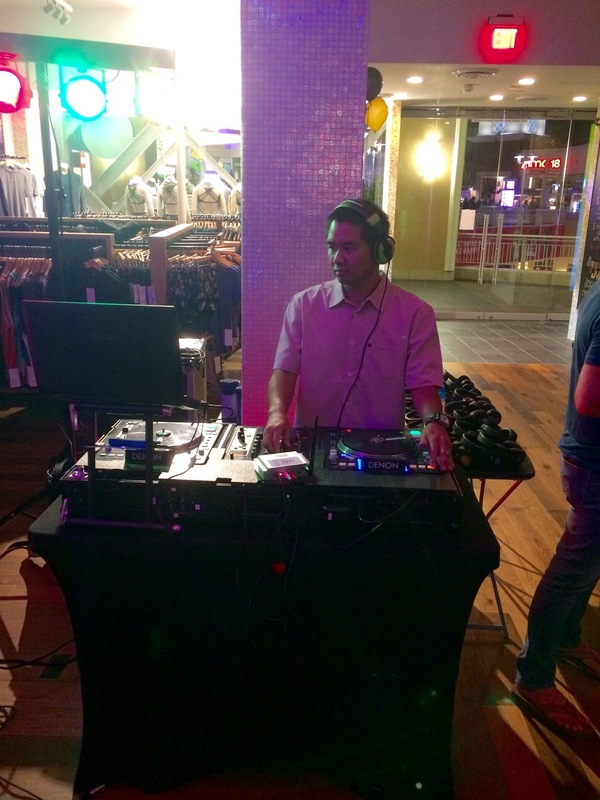 On occassion I have the privilege of DJing for Lululemon customers at Fashion Valley Mall and downtown La Jolla. 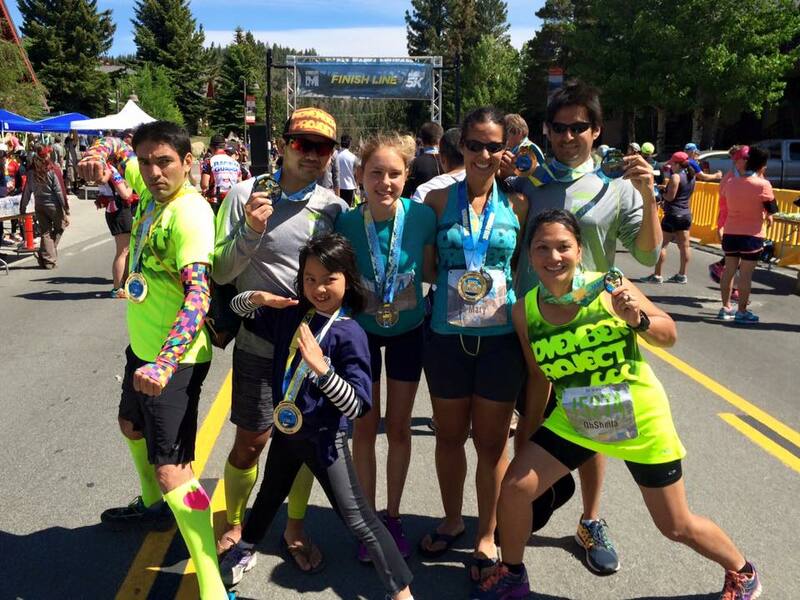 Lululemon run ambassadors, Pace Beavers and all around awesome ladies, Lauren Padula (left) and Sheri Matthews. Now this journey has come full circle. Here I was, in the beautiful city of Vancouver, with my strongest supporters, my wife and daughter who cheer me on in life and in running and I was set to run a race orchestrated by a company that has brought so many other supportive friends into my life. Coincidentally, two of them -- the aforementioned, Lauren and Sheri (shown in the photo on the right) -- were official pacers, running about 20 minutes ahead of me. It was poetic that ultimately Lululemon was what led me to these ladies. They’ve helped me set and achieve personal goals by following in their virtual footsteps, setting the pace for the next chapter in my life. But on this day, I was literally following them, en route to a 1 hour and 57 minute finish time. At the end of the race -- as they do everytime I am working out with them -- there they were, with a big hug and high five. I suppose the only way to end this would be to say thank you. Keep treating your employees right and they will continue to treat your customers right. It’s amazing how that philosophy trickles down.